AWN managing director John Colley. NEW Zealand’s prohibition on surgical mulesing of sheep from next month has “opened the door” to the banning of the practice worldwide, according to Australian Wool Network managing director John Colley. But price premiums for non-mulesed wool and discounts for mulesed wool, would “eventually tell the future”, he said. New Zealand regulations coming into effect on October 1 this year include fines of up to $25,000 for companies who mules sheep, leaving Australia as the last country yet to make a national commitment to discontinuing the practice. “What New Zealand has done is open the door to banning mulesing worldwide…each country will make its own mind up, as will our growers here in Australia,” Mr Colley said. Mr Colley said it is possible to contract 500c/kg clean above the current market for non-mulesed status superfine wool and up to 300c/kg clean for other types. 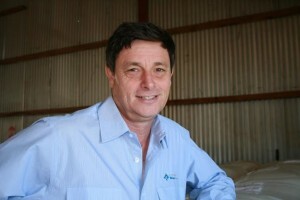 Mr Colley said AWN believed the evolution of the Australian industry will be to non-mulesed wool production over time. Mr Colley said Australia committed to removing mulesing some 10 years ago, but had not done this. “Alternatives must be sought, such as the cryogenic liquid nitrogen process for us to remain the leaders in supply of the world’s best wool. “We believe it imperative that growers understand what the market and the consumers want and are demanding,” he said. “The brands that are demanding non-mulesed wool grow every day. Mr Colley said New Zealand is in a very different position to Australia. “They have a smaller number of producers, smaller volumes and very proactive growers, and with the aid of The New Zealand Merino Company they have established premiums in the market for non-mulesed status wool. In July this year, Australian Wool Network announced a partnership with The New Zealand Merino Company, allowing AWN to supply non-mulesed wool to NZM’s ZQ Merino program, touted as the world’s largest ethical wool brand. Mr Colley said Australians are always slow to react and change. “A clear example of that was the move to Nylon packs. “NZ did it in one year, we took six,” he said. As chairman of the National Council of Wool Selling Brokers of Australia, Mr Colley said members believed it is their job to portray to their clients the real information regarding premiums and the push for NM status wool. “NCWSBA totally supports the reporting of AWEX data that demonstrates the premiums available either in auction or by contract, which are substantial.